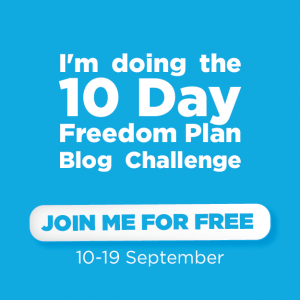 So today’s challenge – set yourself a daily success plan – concerned me slightly! I’m not great at disciplining myself and being consistent about what I do every day, although I’m aware that it’s really helpful to be organised. I think I’ve said before that my workload at the minute varies, so it’s hard to plan when I’ll do things. However, if I apply some structure now, that’ll stand me in good stead when my work’s on a more even keel. I can give myself 20 minutes at the start of my day to reflect where I am with business development, and identify my two or three MIAs (most important actions). I’d also like to use this time to reaffirm my intentions, which I know is a good way to fix your ideal lifestyle in your mind. I’ve been using e.ggtimer.com for a few months and find it helps my concentration massively, but I work in 20 minute bursts, so I’d best move on to the pomodoro option! I’m also cutting back on attending external events, unless there’s a clear benefit for me moving forward (and closer to location independence) and trying to have more meetings via Skype, which is more efficient and practical. So the time I save there I can reinvest – I’d like to have one pomodoro session devoted to reading a business or reference book. I’ve got a pile on my shelf and a virtual stack on my Kindle, so this would be a proactive way to tackle them. I’ll also switch off my phone notifications and use Inbox Pause on my Google account. I’m fortunate to have a small room which I can use exclusively for my office. I’ll reinstall Leech Blocker as well to stop me checking the news and so on. I feel like there should be something specific I should add to my daily routine to show I’m making progress towards my goals of working from anywhere and with high-impact entrepreneurs, but I’m not sure what. Maybe this needs more thought! I noticed your comment on the #10DBC and related to your struggle. I’m not one for having a ‘regular schedule’, but I have found that I have a work routine, and within it I get a lot done – it sounds like you do too. I wonder if you might benefit from a couple of free tools I use? One of them is called Pomotodo, and combines a task list so that you can look back over the week / month to see the progress. There are similar tools for the iphone too, but I haven’t used them… just thought I’d mention them both, in case it helps ease things in your life, like it does in mine.